The sea breeze usually begins during midmorning (0900-1100 local time) when the land areas become warmer than adjacent ocean waters (see fig. 3-25). This temperature difference creates an area of slightly lower surface pressures over land compared to the now cooler waters. The result is a wind flow from water to land. The sea breeze starts with a shallow flow along the surface; however, as maximum heating occurs, the flow increases with height. The height varies from an average of 3,000 feet in moderately warm climates to 4,500 (or more) in tropical regions. The effects of the sea breeze can be felt as far as 30 miles both onshore and offshore. In extreme cases, the sea breeze is felt 100 miles inland depending upon terrain. By mid afternoon (maximum heating) the sea breeze will reach its maximum speed and may be strong enough to be influenced by the Coriolis force, which causes it to flow at an angle to the shore. The sea breeze is most pronounced in late spring, summer, and early fall when maximum temperature differences occur between land and water surfaces. A decrease in temperature and an increase in humidity and wind speed mark the start of a sea breeze. The sea breeze continues until the land area cools sufficiently to dissipate the weak low pressure. After sunset, the land cools at a faster rate than the adjacent waters and eventually produces a complete reversal of the winds. As the land continues to cool through the evening hours, a weak area of high pressure forms over the land. The water area, with its warmer temperatures, has slightly lower pressure and again a flow is established; however, the flow is now from land to water (offshore). (See fig. 3-25.) The land breezes, when compared to the sea breezes, are less extensive and not as strong (usually less than 10 knots and less than 10 miles offshore). This is because there is less temperature contrast at night between land and water surfaces as compared to the temperature contrast during daytime heating. Land breezes are at maximum development late at night, in late fall and early winter. In the tropical land regions, the land and sea breezes are repeated day after day with great regularity. In high latitudes the land and sea breezes are often masked by winds of synoptic features. WINDS DUE TO LOCAL COOLING AND HEATING In the next sections we discuss tertiary circulations due to local cooling and heating effects. Under normal circumstances, these winds attain only light to moderate wind speeds; however, winds often occur in and near mountain areas that have undergone dramatic changes in normal character. At times, mountain areas tend to funnel winds through valleys and mountain passes. This funneling effect produces extremely dangerous wind speeds. FUNNEL EFFECT Winds blowing against mountain barriers tend to flatten out and go around or over them. If a pass or a valley breaks the barrier, the air is forced through the break at considerable speed. 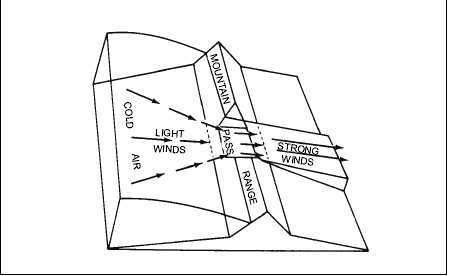 When wind is forced through narrow valleys it is known as the funnel effect and is explained by Bernoullis theorem. According to Bernoullis theorem, pressures are least where velocities are greatest; likewise, pressures are greatest where velocities are least. This observation is true for both liquids and gases. (See fig. 3-26.) 3-23 HIGH PRESSURE LOW PRESSURE AG5f0326 Figure 3-26.Strong wind produced by funneling.